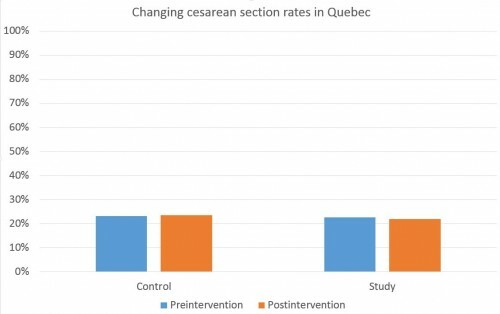 BACKGROUND: In Canada, cesarean delivery rates have increased substantially over the past decade. Effective, safe strategies are needed to reduce these rates. METHODS: We conducted a cluster-randomized, controlled trial of a multifaceted 1.5-year intervention at 32 hospitals in Quebec. The intervention involved audits of indications for cesarean delivery, provision of feedback to health professionals, and implementation of best practices. The primary outcome was the cesarean delivery rate in the 1-year postintervention period. That’s actually a statistically significant result. So it’s a success. The overall rate went down 0.7% in the study group and up 0.3% in the control group. It also went down in the low-risk group, but not in the high-risk group, so it’s likely that the “correct” c-sections were the ones avoided. But this took 1.5 years, a lot of manpower, and I assume a lot of money. And that’s how much things changed. Changing behavior is hard.